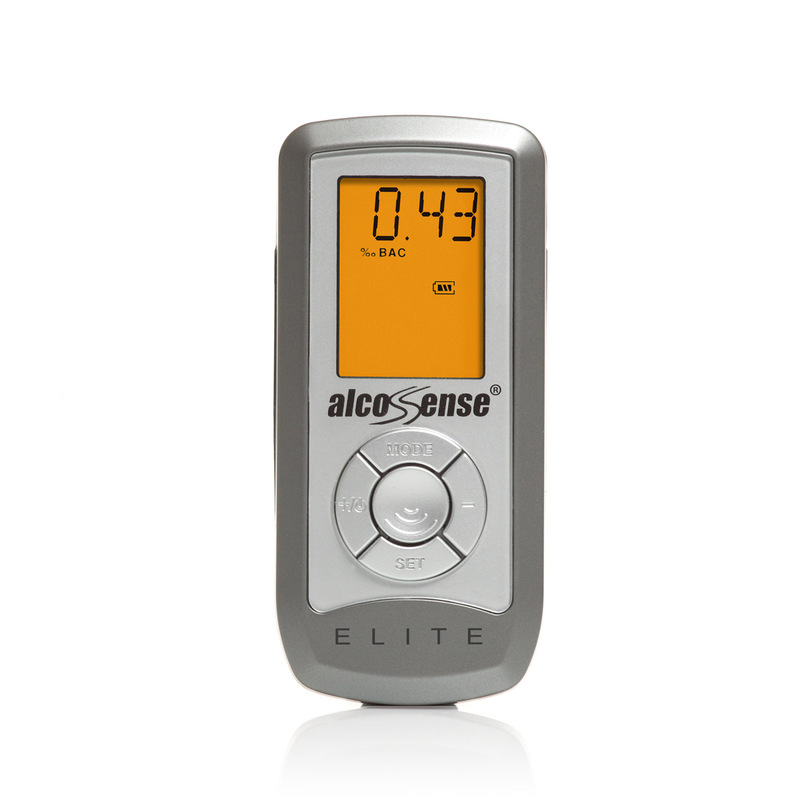 The multi-award winning AlcoSense Elite is our flagship semi-conductor sensor breathalyser. Having won the Fifth Gear, What Car? Magazine, Road safety Analysis and Wired Magazine Group Tests it's won more awards than all of our competitors put together. 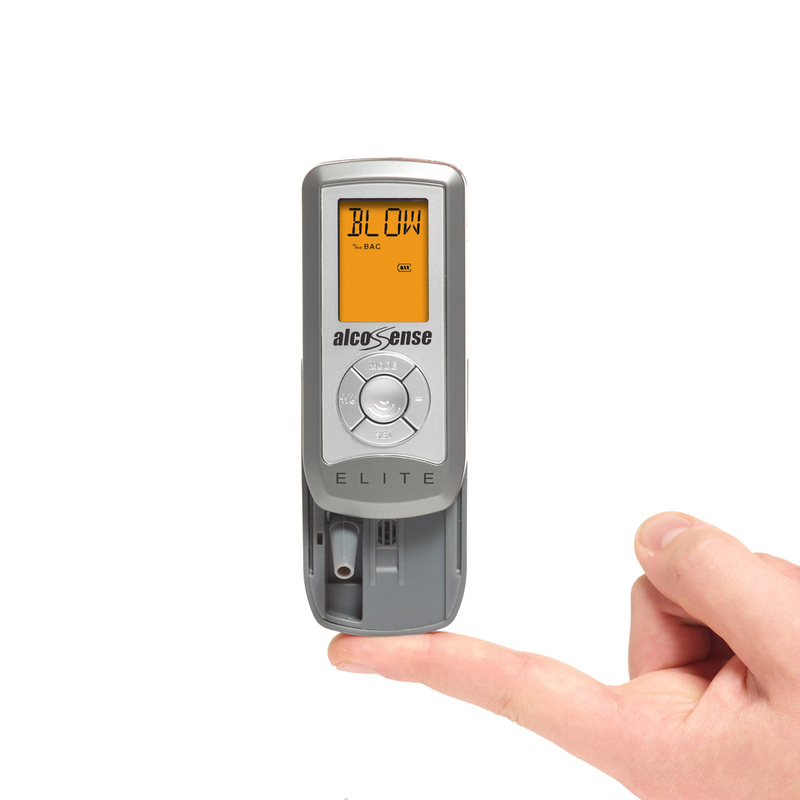 AlcoSense™ Elite has been designed to be as easy as possible to use and designed to fit in the palm of your hand. 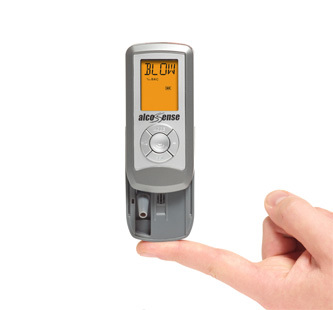 To activate the breathalyser all you do is slide the AlcoSense™ open. Once open it prepares the sensor and the screen will show a count down from 19 to 0, then it will display Blow. When it says blow, blow through the tube for approximately 5 seconds until it beeps. This is the New Multi Alert Level for England, Wales and Scotland! On 5th December 2014 Scotland lowered its drink drive limit from 0.80‰BAC (80mg of alcohol per 100ml of blood) to 0.50‰BAC (50mg of alcohol per 100ml of blood), England, Wales and Northern Ireland stay at 0.80‰BAC. AlcoSense shows you a reading of your alcohol level so you can use the Scottish or English version of the product in either territory. The Scottish version displays a ‘Don’t Drive’ alert from 0.30‰BAC upward and the English/Welsh version from 0.6‰BAC upwards. AlcoSense Elite uses a revolutionary in built air flow sensor meaning that you can't blow too hard or too softly into the unit. If you blow too hard or too soft you can falsely make other breathalysers read too high or too low respectfully. If you don’t blow at the correct pressure the AlcoSense Elite will display Error on the screen and allow you to re-take the test. The AlcoSense™ unit shows your level of intoxication in either mg/l (milligrams per litre of breath) or ‰ BAC (per-mil blood alcohol content) and shows your reading in increments of 0.01. It will even alert you when you are near or over a pre-set limit, please see the screen shots below. Pocket sized, it can discretely be kept anywhere. AlcoSense™ measures only 95mm (height) x 34mm (width) x 25mm (depth) when closed. It is powered by 3 x AAA batteries (included in the pack) meaning that you can use it anywhere at any time. The AlcoSense™ unit automatically performs a sensor clean after every time it is used, helping to keep the sensor in top condition and reading at its most accurate. Without cleaning moisture, oxidisation and contaminants such as tannin can build up, significantly affecting the quality of readings. With AlcoSense™ Elite's automatic sensor clean after every blow test the unit will continue to perform at its best throughout its lifetime. For a deeper clean AlcoSense™ Elite also has a feature called ASC (Auto Sensor Clean) which is designed to be used every now and again to give the unit a ‘spring clean', again ensuring that the unit reads to the highest levels of accuracy. All you have to do is press a button and your AlcoSense™ Elite unit will do the rest for you. Using the latest technology and innovations, such as sensor algorithm and automatic sensor maintenance, AlcoSense™ Elite can be used again and again whilst maintaining better accuracy. Every AlcoSense unit is tested for accuracy three times before leaving our factory. As a result our quality control is arguably the best in the industry meaning that you can have 100% faith in our products. 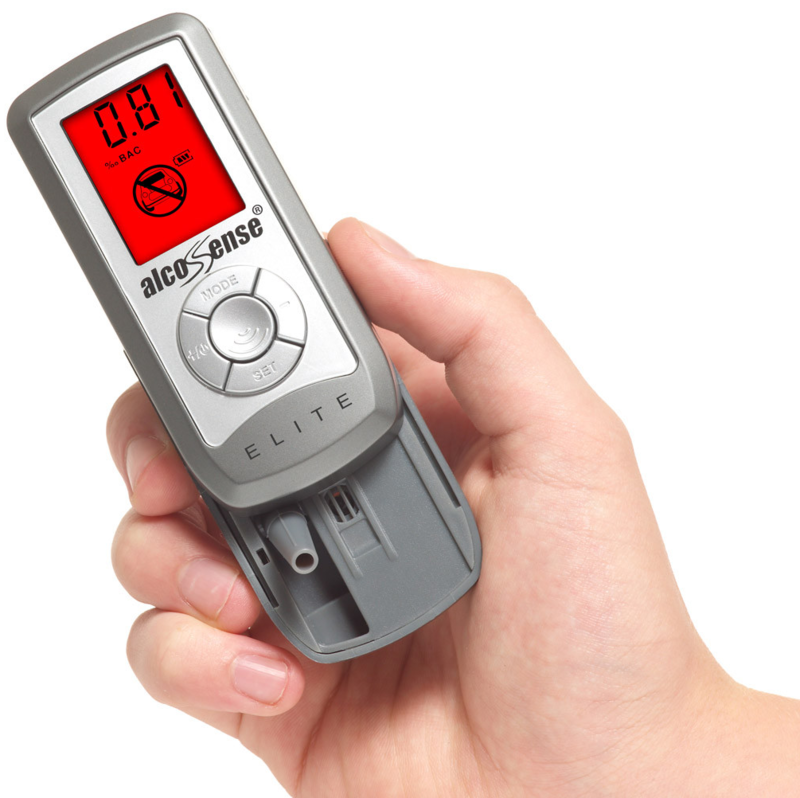 AlcoSense Elite has industry leading accuracy of +/-0.2‰BAC which is unique in this price range. Part of the responsible enjoyment of alcohol is to understand its effect on the body and to understand when you are safe to drive, AlcoSense™ helps people do exactly that and takes out the potentially fatal guess work the morning after. Don’t leave it to chance, order yours today. To see the full review including their direct test against rival breathalysers and the Police breathalyser please click play on the video below. Last November What Car? Magazine performed one of the most scientific reviews of personal breathalysers ever done by a media company. They tested 8 devices on the market, ranging from £20 to £300 to find if, and how well they work. AlcoSense cleaned up in its price categories! 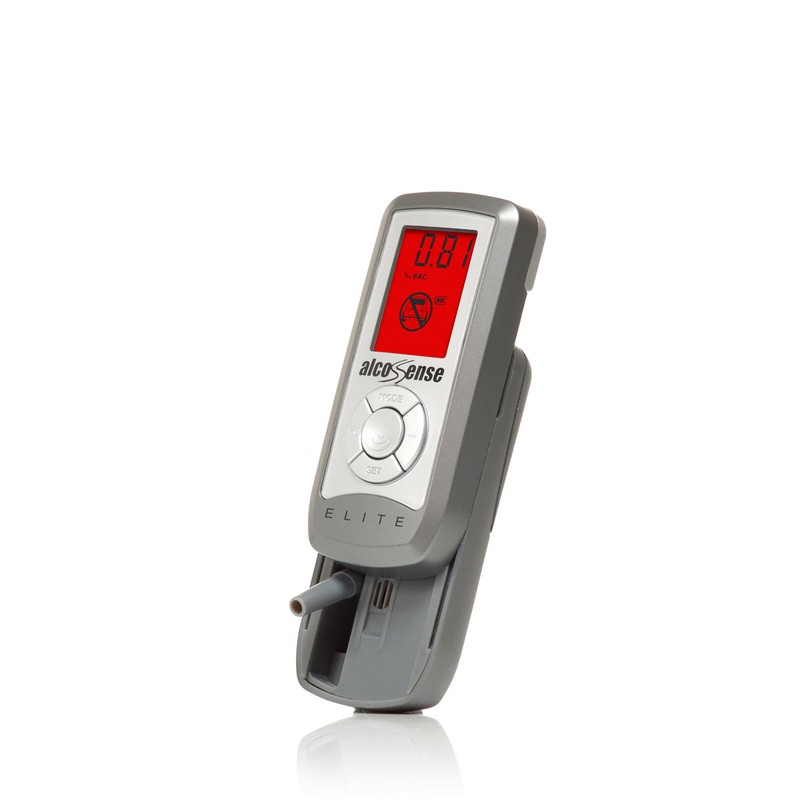 "The AlcoSense Elite performed well in our tests, giving accurate results throughout. Good performance at a reasonable price." In May 2015 Wired Magazine peformed a mini group test with 4 breathalyzers, the Alcosense Elite won both categories for both the Scottish and English Drink Drive Limit. "The AlcoSense Elite delivered a reading of 0.76 when tested with the 0.80 solution - the closest of any to the Police breathalyzer. Blown through with the 0.50 BAC solution, it returned an exact reading." 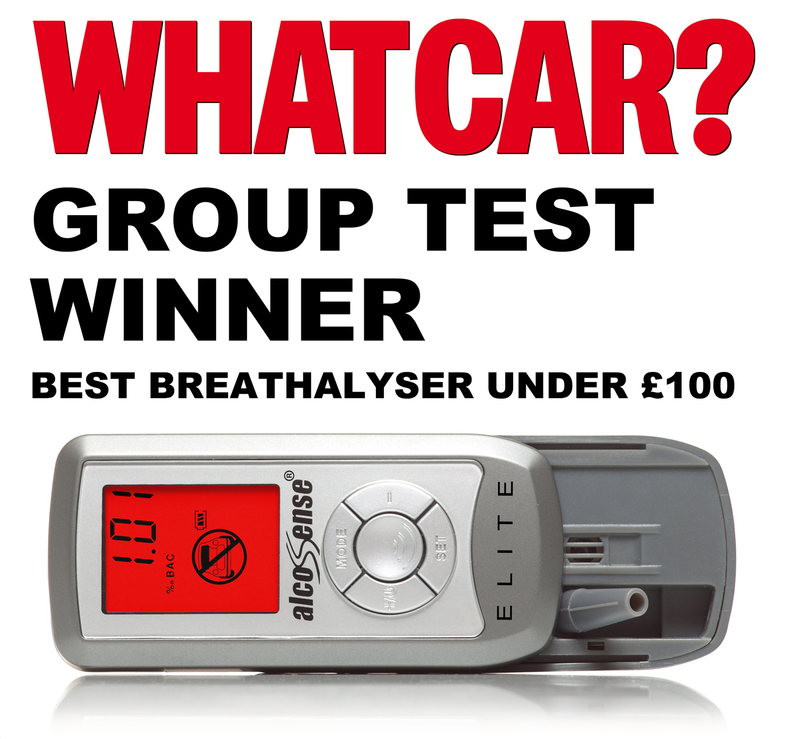 In December 2014 Diesel Car Magazine performed a group test of 9 consumer breathalysers, the AlcoSense Elite won the group test with the AlcoSense Lite coming in a close second. "The prestige breathalyzer, neat and easy to use, very accurate." On 7th December 2014 The Sunday Post newspaper performed a group test with 4 consumer breathalyzers pitched head to head against a Lion 500 Police Breathalyzer. The AlcoSense Elite won the group test, with the AlcoSense Lite finishing runner up. At the reference reading of 50mg/100ml of alcohol in blood the AlcoSense Elite exactly matched the Lion 500 Police Breathalyzer. In December 2013 Road Safety Analysis Ltd, a not-for-profit road safety research company, performed a head to head test of 7 consumer breathalysers vs a Police issue Lion Breathalyser. The test had two elements, one to test the devices head to head in a ‘street’ real world environment and the second part to test the devices head to head in laboratory conditions using Police grade alcohol simulators. 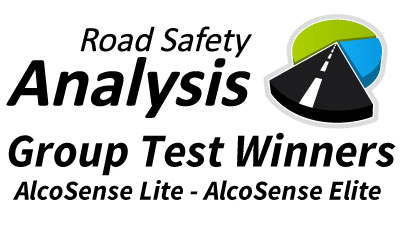 The AlcoSense Lite and Elite were both tested and came out highly recommended, the Elite winning hands down over the competition – even against breathalysers twice the price! "Without a doubt the leader in our street test was the Alcosense Elite. It consistently performed well against the police issue breathalyser, giving accurate readings every time… It’s very simple to use, and a lot of attention to detail has gone into the design… Priced at just £59.99, it can be bought in such stores as Halfords, and certainly would make me part with my money for that price." 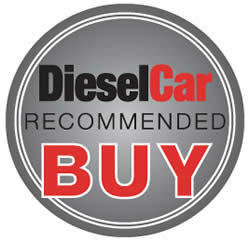 "If a fuel-cell breathalyser is beyond your budget, this semi-conductor Elite is a good buy. It couldn't match the accuracy of AlcoSense's fuel-cell units, but it was best of the rest by some margin"
"If you have had a heavy night and intend to drive the next morning, I suggest that you invest in AlcoSense, A mobile phone-sized breath-tester that can accurately measure if you are near or over the drink drive limit." "Rather than join the 17% of drink drivers who are busted the morning after, the AlcoSense let’s you know when you’re safe to hit to road. It's remarkable how long into a Sunday you can get before you're legal." "Overall AlcoSense is highly recommended and a great bit of kit to own." 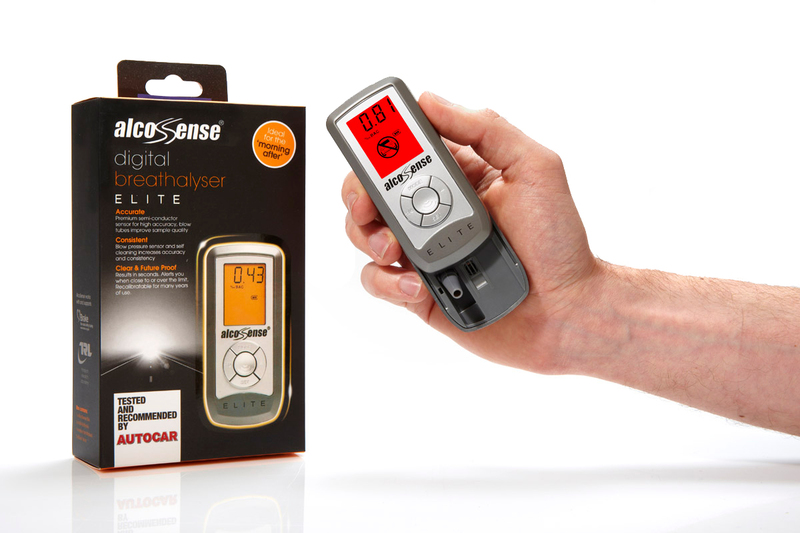 "A peace of mind tool that could possibly save your licence - and your life - I think the AlcoSense is well worth its £60 price tag "
"The AlcoSense is durable and easy to use, just breathe in to it and it tells you if you are over the limit… useful for the morning after." "Are you sure your blood-alcohol levels will have lapsed sufficiently by the time you drive your car the following morning? That's the kind of folly the AlcoSense is designed to combat: it is based around the same principles as police-spec breathalysers and provides an instant read-out that tells you whether or not you are fit to take the wheel." "Test yourself. AlcoSense is a tool to help judge if you’re safe to drive the morning after. We tried AlcoSense and it proved to be accurate when compared with the Transport Research Laboratory’s equipment." "Just three large glasses can put you over the limit the next day. If AlcoSense comes out positive, get the bus!" "Breathalyse yourself, before the fuzz catch you doing an Alistair Stewart, with an AlcoSense Pocket Breathalyser. Be Safe"
"It won't stop you drinking but it will warn you if you're over the limit the morning after. It may not be the merriest Xmas present, but it could well be the most useful"
"Seems like a good idea to us!" "Don't get nicked the morning after the night before...buy AlcoSense"
"To prove my inebriation I test myself when I arrive back using an AlcoSense portable breathalyser. At 0700 the reading was clear..."
"This could be the device that comes between you and a night in the cells"
"The AlcoSense Elite is an update of a classic that's been around for a couple of years now" "The AlcoSense... works a treat...especially for those iffy morning-after drives." Initially used a friend's one and now just bought my own. Quite excellent - straightforward to set up and simple to use. A small price to pay for peace of mind, particularly when contemplating driving 'the morning after'. Thoroughly recommend this quality product, delivered extremely promptly. Very clear instructions and easy to use. Buy one or don’t drive! I’d been looking at getting a breathalyzer for sometime as the likelihood of being over the limit the morning after is very high. A friend of mine recommended the Alcosense Elite and he’d previously had the Lite version. Seems it’s the best out there. Should be made law to carry one as there would be no excuse for endangering other people.I’ve been on nights out and felt 100% fine the morning after but after using my mates Alcosense I definitely was not! Worked perfectly and potentially saved any stupid mistakes.Definitely recommend this product, get one and be responsible ???? Very good, peace of mind. Brilliant breathaliser I would definitely recommend this product to anyone. Getting totally random readings mainly saying I'm over the limit when readings should be zero or near zero also getting readings saying I'm fine to drive ,was hoping to use this device when I have a drink on a day out to make sure I'm under the limit before driving but it says not to use straight after drinking as it can damage it ,it also says eating certain foods or soft drinks can effect it so it seems you have to wait around 90 mins with no food or drink or cleaning your teeth to be of much use ,so nothing like the police use . Only just received. Was easy enough to set up and worked fine!So far am very impressed. Would recommend! Brilliant product, gives great piece of mind.......! Very easy to use and seemingly precise with a clear instruction booklet. Set up and calibration can be a bit fiddly but it's just a minor hurdle.Based on other reviews, demonstration videos and awards/certificates, it appears to be one of the most accurate consumer devices but I have yet to prove this for myself. I aim to compare this against an official police device so I can use it with full confidence, but until then I will use this a measure of reassurance long after drinking. Easy to use and prompt delivery! Good product! Well made and easy to use, seems fine. Excellent product. Made in the UK too. I use this as a morning after check and can recommend this product to anyone. It appears very accurate and very easy to use. I carry this everywhere as I travel a bit for work. Great device, worth every penny. Used this product for over a year now, it is a must have. On those days when your not sure if you are tired or just a little bit tipsy from last nights session, this is a good indication if you are over the limit. Why risk it? buy the product, then you know where you stand. Watched a review on fifth gear TV show that made me buy this model. Battery life is good, compact. best £ spent in a while. I’m in a safety sensitive position and needed an easy way to safeguard my position and license. This unit is compact and so easy to use! Foolproof. Set it to the lowest limit and good to go. Excellent value and peace of mind. Bought this to test my 19 year old son the morning after he goes out clubbing and wants to drive the following day. It appears to be very accurate and therefore gives me great peace of mind. Excellent buy. I would definitely recommend this purchase to anyone who enjoys a drink and is a driver. It is better to know what your level is than think you know and this device certainly helps ensuring I am not getting behind the wheel of a car whilst over the limit. Going into the christmas season where there will be get togethers and parties, for the morning after this device could be the difference between retaining your drivers licence or losing it (and far worse).It is easy to use, just switch on, let it calibrate and blow using the provided straws. It will let you know if you are over or under whatever limit it is set to. Results can be variable but it's useful as a guide. This is the second Alcosense Elite I’ve bought, my first was several years ago. I’m convinced it’s the reason I still have a driving licence! Really simple to use and well worth the money. excellent product, very easy to use. Excellent piece of kit. I've only had this a month so its early days. I did like the manufacturer offer to upgrade, which I thought was innovative and tempting. As far as I can tell, this one is a good compromise between cost and accuracy of the measuring sensor. Well worth considering by any responsible driver who has to attend functions for work etc. Not tested it as yet after drinking, but all the set up instructions worked. It's ready to use now. Great UK manufactured Product, delivered next day as per ordered....... tried it out for first time last Sunday morning after 'reasonably heavy' Saturday night..... three of the four of us were over the limit.....all felt perfectly fine to drive..... a licence saver for the driver, or a life saver for somebody else... potentially both I reckon. A great little product: really easy to set up and use, good value and seems to be accurate (independent tests support this like WhatCars). Recommended for the morning after. I bought this device to check for alcohol level when driving in various countries that have different limits. It is very easy to use, quick and simple. Easy to use and useful. great for morning after check. Very easy to use and an 'eye-opener' on individuals different alcohol levels, when drinking the same amount! I received this last week. One needs to be sober to follow the instructions to get the instrument activated - but no problems! I've tested it after varying measures of wine and the readings seem commensurate with the dose taken! I also purchased the carrying-pouch - again well made but it could be a tad smaller to make less of a bulge in the pocket. Easy to clean, easy to use and very good quality. So easy to use, very clear result, brilliant, glad I bought it. It feels solid and great quality too. Great little breathalyser. Excellent product and value. Product is excellent. Great little breathalyser that is easy to setup and use. Great instructions. Would highly recommend. Also purchased a spare pack of tubes and a little case to keep it safe and clean during storage. THIS IS A FANTASTIC PRODUCT. FAST, SIMPLE AND ACCURATE.10 OUT OF 10 FROM ME. My take on the Elite Breathalyzer. Have read good reports in past issues of What Car which decided me to buy this particular model.I am impressed with the handbook giving excellent instructions on the use of the Elite Breathalyzer particularly giving the limit levels of lots of other countries.Ease of use is excellent. I bought this Breathalyzer to replace the one I have been using for a few years - an AlcoSense Lite. It always gave me confidence that I was safe to drive. I've only used this one a couple of times so far - easy to set up and use. Quality piece of equipment, well made and easy to use. Delighted with my purchase. Many thanks. It is a good product and pretty much delivers what expected. Can detect beyond what it suggests as well, 1.2. This is such a simple but clever piece of equipment. Very easy to use, it has a professional feel to it, much I imagine like one the police would use. Although I cannot verify the accuracy of the readings, it does seem to give readings that match my estimations. I would certainly recommend this item to anyone wishing to make sure they are not driving with excess alcohol in them. Excellent product and excellent service from the provider. Bought this for my son to keep in his car, so he can check he is OK to drive the next day after a party/night out etc. Easy to use and very reliable, definitely recommend to buy one. Having just purchased the alcosense elite from Amazon I must say that once I read the full instructions to learn how the system works in terms of breath samples etc, I can say that this device works fantastically well, I have tested it thoroughly by have made sure I was over the limit the night before and when I tested my breath the following morning was amazed how much alcohol was still in my system. It has already potentially saved my driving licence as I only went for a drive once my breath reading reduced sufficiently a few hours after. It is a must have morning after tool. Does what it says on the box. Very clear and easy to use. The quality of this product seems excellent but I wish it were sold with a pouch of some sort to contain the machine itself and the blow-tubes.I have made a few tests and it seems to be pretty accurate – insofar as one ever knows the actual level of alcohol in the blood.I don't think it will ever give you an exact reading below 0.2 – it just reads 'LO'. This is fine and perhaps a good thing as one might be rather shocked to find trace levels of alcohol in the bloodstream in the morning!Overall, I am very pleased with this excellent product and can recommend it to anyone who drinks alcohol. Had this little thing for a few days now. It arrived well packaged. Contained in the box was the AlcoSense Elite itself with 5 blow tubes, batteries and instruction booklet. Easy to set up, comfortable to hold, and the screen is visible when in use. It appears to be accurate as the results have been as expected. This is definitely more consistent than my previous breathalyser (which was much cheaper). I would say this is worth the extra money! TOTALLY love this product, well worth the money. The company also got in contact to see if there were any issues. Great British company with fantastic customer service. Very pleased with this product. it was straightforward to set up and is very easy to use. Recommended. Easy to use and very compact. Would recommend. Really easy to use and very handy to have for the morning after. Amber and red alerts are excellent visual reminders. An excellent product which gives absolute assurance that you are not I I have had an AlcosenSence for over two years after reading a Which review. You can be assured you are not over the drink drive limit especially in the morning. This gives peace of mind that you are not putting lives at risk.Took it to Europe when travelling there and where it is compulsory. Once again what peace of mind. Easy to use, but do read the set-up instructions carefully. Very impressed with its ease of use and design. Well done to the British manufacturers competing with the Far East! I've had the AlcoSense Elite breathalyser now for just over a week and so have only had a couple of occasions to check it works. From what I can see, the breathalyser is very accurate and provides significant piece of mind. It is very easy to setup and use, only taking me 5 minutes to install the included batteries, read the comprehensive manual and set the time/BAC level before testing. I particularly appreciate the self cleaning function that allows two users to be tested in close proximity (following the instructions). The UK based recalibration service offered by AlcoSense is the final reason why this absolutely gets a 5 star review. First class product. Defiantly recommend. This is a serious product. It's well made, very accurate and easy to use. Great value for a high quality tester. Highly recommended. I am a H&S manager on a £123 Million project with hundreds of workers, I have tried a few Breathalyzers before, sadly I have noted that most of them are from China, cheap has not been a good buy for me but this unit has, it is and will be used daily and it is performing very well, I would recommend this unit if you need a good reliable item of kit. Simple robust smart and effective design. Easy to use, accurate and able to select a number of different thresholds.Also manufacture provides the service to recalibrate, if required. I bought one for myself around 2 months ago and tested it out myself for the "morning after" feeling. It appeared accurate and as a result I bought another two for my daughters so they could make sure they were recovered if drinking the night before and driving early the following morning. They were quite surprised how long it took for the alcohol to be out of their system and to be sure they are legally fit to drive. A good discipline for them rather than just assuming ok after a nights sleep. This is a birthday present for my husband so havent used it yet. Bought it as it was recommended by a friend and his device stopped my son driving at Christmas. He was about to leave at 9am but he found he was still over the limit from the night before so feel it is worth every penny! I have been using this for a few months now, it has been reassuring using it the morning after to double check I'm not over the limit!! I like to make sure I have nothing left in my system before driving; on one occasion it said I had alcohol in my system the morning after (not a huge amount) and I couldn't feel it at all. Ordinarily I would have driven but thanks to this I did not. This is my second purchase of the AlcoSense Elite - not because the first one fell apart but quite the reverse, it is still working perfectly. This second purchase is for my son to keep for his own next-morning testing (he kept using mine) to make sure he is clear to drive after one of his student "night befores". AlcoSense Elite is a good price for something that is reliable - robust, well constructed, easy to use, and gives read-outs that I am convinced are accurate. You sort of know before you use it whether you will be able to drive, and the read outs pretty much confirm where you are. I don't drive unless it is well below the limit or "clear", especially with the lower limits in Scotland, and also Spain where I do a bit of driving. A query I had was answered quickly. They provide an 0800 free telephone line. Good service. Great product and an essential piece of kit for everyone. The instructions are clear so it's easy to use. We should all have one in the car. I deliberated for months and months whether I needed to buy a breathalyser. I recently decided to purchase one, as I was going on holiday, and after doing a fair bit of research I chose The AlcoSense Elite. I'm so glad I did. Drinking most nights and driving out the next morning, the peace of mind it gave was invaluable. I did 5 tests, and every one seemed really accurate. The heavier nights' drinking showed in the result the morning after! If you're reading reviews, you're obviously looking for a bit of help. I'll give you some - just buy one! Easy to use good product , had one before doesn't measure up to this one. Works well, Can't say how it compares to a police tester (hope I never have to) But as far as I can tell it's a great little product. Did a lot of personal product research before purchasing this item and I could not find ANY sensible bad reviews. The reason is simple and that is that the item is effective and good value for money.I would recommend this product without hesitation. It was also enjoyable testing the product out for efficiency. Closest to a police device. After long research i believe i have the closest i could possibly get to a police device. . . Genuinely happy with alcosense elite. Great product, reassuringly expensive but worth every penny as my driving licence is priceless. This is the second AlcoSense Breathalyser I have bought. The first one served me for a few years and this Elite version seems even better. I work away from home and I find this very handy as I work on a site where random drink and drugs test take place. If I have a few beers the night before I can check my alcohol level in my hotel room before going on site. Simple to use once set up. Feels like a quality product compared maybe to other cheaper alternatives. The What Car review sold it to me. Excellent product. Bought to safeguard against any possibility of a 'morning after' mistake. Chose alcosense because of reviews on accuracy against police roadside breathalyser. Remarkable how one can feel fine, but still be over the limit the next day. If the stats are anything to go by, the 'boys in blue' have cottoned on to the inadvertent offender who wouldn't dream of driving home from the pub after a few, but innocently gets behind the wheel the next morning. For 60 quid its good value for peace of mind. An important point to note is that it will need re-calibrating periodically (annually) - the manufacturers offer this service for about 20 quid.It may be a design feature, but mine tended to drift high as the sensor became poisoned - which if you are going to get a slightly inaccurate reading, at least it's on the right side!! Great Device. Worth spending a little extra. False economy to go for cheaper products. I am very impressed with this device. It definitely seems to be one of the best around for an all up package.It works quickly and I would trust it well when used with common sense also. It has helped to bring me confidence the next morning more than anything.I like that the unit is self contained, but you do not need to carry the tubes for breathing in separately, howver this is not a problem if you keep it all stored in the box it comes in. I would generally always have at home ready to use in the box and therefore all 5 tubes provided in the box with it. I keep the other tubes in case anyone else needs to use. Easy to take this with you in the car too. Pop it in the glovebox and check you are safe to drive rather than risking it and if you look too close get a taxi.You can easily change settings as required to different levels, so you can use in England, Wales and Ireland at 80 milligrammes of alcohol per 100 millilitres of blood and for Scotland at 50 mg/100ml which follows the same regulation as in Europe for the most part . Therefore you can switch between them easily as necessary. There is also a function to be able to check calibration with a small tab on the back which contains a very small piece of foam that can be soaked in a given alcohol mix to calibrate. Do not make the near mistake I did and think the foam was a packing piece. Thankfully I did read the manual and realised before I threw away.Anyway this is a great buy and Im very glad I spent the extra money. The price is still good considering how important it is to have something like this to save yourself, others or losing your license. Excellent bit of kit. Use if I have had a few beers the night before. Gives a good indication of my blood alcohol reading. Very pleased. Excellent device. Easy to set up, easy to use, and gives you piece of mind when driving (or not) the morning after the night before. If you are even thinking about it, buy it! Very pleased with this device, my son has purchased one as well. Gives you peace of mind. Very happy with the purchase. It gives that extra piece of mind when tou intend driving in the early morning after anfew drinks the night before. Compact and easy to use, I would highly recommend it. Incorrect readings constantly unit sent back to Amazon. This item showed incorrect readings from day 1 for both myself and my partner we had no alcohol for 4 days but still showed over 0.5 on numerous attempts at blowing, i returned the item to Amazon and received a full refund and now back to square 1 with looking for a breathalyser. I'm very pleased with the prompt delivery. The item which I have used a couple of times is great & very simple to use. The only negative comment I can make is that I called the customer services no for assistance on Saturday & really got the impression I had disturbed the guy on the phone who informed me the instructions were all in the leaflet. Because he was pretty unhelpful I got him to talk me through setting up the whole product. I have used the AlcoSense Elite for many years. I recently bought a new one because of the change in drink drive limits in Scotland. With the new one you can set 3 different levels for many different Countries so is ideal for taking abroad with you if you are driving there. I have found it to be invaluable for the morning after. By using this over a period of time i now have a good idea of the amount i can drink depending on what time i am driving next morning. It is always reassuring to know that this device will keep me safe. It is important to follow the instructions as smoking, using mouthwash or even eating some types of food can affect the reading. That is how accurate this device is. I do not condone drink driving but the morning after catches more people over the limit than anything else. It makes sense to use this device to stay safe. Highly recommended. Has been very accurate. Bought for someone who wanted to make sure it was safeasy to drive day after drinking. The Elite once calibrated is accurate and reliable. Caution is advised as certain drinks like cider and beer are absorbed by the body differently. If you are in any doubt don`t drive. Have only just started to use the Elite, it is easy to set up and use, I was expecting the 0.8 limit version so nice surprise to receive the multi limit version as I drive in France occasionally.Note there is a minimum time limit between last alcoholic drink and use of the unit so it really is best for morning after!! If I had realised this at time of purchase I would have likely upgraded to a model that could be used after a drink. This product has an important use for the social drinker.We all know that drinking then driving is totally unacceptable and I feel that I do not need a product to advise me in this regard. It's the morning after that this device comes into its own, we may feel fine and get in the car to drive, however, you may still be over the limit and besides the legal consequences, you are potentially putting other road users at risk - so this handy device takes any doubt out of the equation.Handy for yourself, family and friends.It's small, smart and very easy to set up and use. The menu is intuitive and you can set the legal limit for the country of your choice.Why would you not get one? Finally got around to buying one of these after putting it off for too long. I have used the single use items in the past which are functional but expensive in the long run.I have used the Elite on 5 occasions through the festive period to take the guess work out of the privilege of driving.The obvious drinking and testing game has also been carried out to "interesting" results.Only used seriously to verify my morning after fitness to drive.Don't guess, don't drink and drive. Test and use common sense! It was a little fiddly activating the sensor but we are really pleased with this product. It is really easy to use and we have faith in the readings. Would recommend to others. A super compact device that has already come in useful over Christmas when my son realised he was still over the limit the day after. Actually bought this as a joke for my hubby. After a party we had we all tried it the next day and was amazed a few folk had to sober up before going home. AlcoSense Elite Breathalyzer is easy to set up. Very easy to use and gives you the peace of mind that you are not breaking the law when you climb in behind the wheel. Safety for you and other road users. Have had the unit for about 1 year seldom used, been out of the country. Sadly it became untrustworthy very quickly with readings all over the scale and very expensive to re-calibrate. Nice idea but not really worth the money, sorry! AlcoSense says: We're sorry to hear your experience. If the breathalyser has been in storage or a long period as it has in your case you would need to activate the sensor again and perform an ASC - this should have it working again for you. Instructions for this are detailed in the user manual. Regarding calibration, all breathalysers, whether ours or a Police model, require periodic calibration. The Elite has a class leading 12 month calibration interval. If you feel your unit is faulty please make contact with our support team who will be able to help and resolve the issue for you. Does what is says on the tin - gives a good clear indication of whether there is alcohol in your system. Actually it is very accurate. Bought this for a driving holiday to Australia where the drink limits are lower than England. I am still to be convinced that it is accurate as I have consumed two pints of premium lager followed by a full bottle of wine with diner with a large brandy to follow. Early next morning still recorded "low". Perhaps I have a very efficient liver but still didn't drive until later in the day. Three weeks of holiday remain- will report back later. Very pleased with this item some shocks when day after tests performed.Stopped people driving the next day! Had my Alcosense Elite for a few months now. It's reassuring to know you are safe to drive. It works well but follow instructions. The official advice is don't drive with any alcohol at all. At 75% of limit it tells you not to drive. I prefer to use 50% as my limit to allow for a good margin of error. Glad I have it to check if I've had a beer. I find the Elite is easy to use ,easy to set up, (you need to read the instructions first),well worth the money. Mainly using it as a next day check before I drive. As I am self employed I can't afford to be over the limit...it's an excellent guide. Even if you are under the limit it tells you how much is in your blood and recommends that you don't drive as your reaction times would be impaired. So if you enjoy a drink, and also care about other people and the consequences on their lives and effects on their family should you risk driving with alcohol in your system, get one of these ! Absolutely vital for testing yourself the next morning. Since using this I have totally changed the way I drink if I know I have to drive the next day. There have been other occasions where I've felt ok but have checked and still been close to or over the limit. A really useful bit of kit to make sure you're ok to drive the morning after even if you feel fine. I purchased this unit as a standby as I do not drink a lot when driving. It is perfect to have by you to use if you think you may be over the legal limit. It was supplied with easy to understand instructions and from what I can tell gives a very reliable reading, it is also very easy to use. I have since purchased some extra straws which were supplied by AlcoSense and as with the meter delivery they were sent well packaged and the orders received in a timely fashion. Recently bought this to prevent the fear of morning after driving and it is the best thing I could have done. Fortunately up until now it has confirmed the ok to drive but it is very reassuring to have that confirmation. I have sense checked it to prove it does work and I am very happy that it works well. Do take the time to read the instructions and follow them step at a time - not difficult but good to know that you have set it up properly. I travel to different locations with different rules so I think it will be even more beneficial in these times. Simple to use - great value. Everyone should have one. Everything about it seems great so far (had it a fortnight) and gives expected readings. Would recommend. It loses one star only for instructions. It doesn't make clear that you don't need to activate the sensor with wine solution when just purchased, contrary to previous reviews, I found out by calling (efficient) help line. This only needs done when you haven't used it for a long period (although wasn't told how long). Also, they don't say if it is essential to use a new straw each time or not. Seems to be ok by just rinsing and reusing the previous one. Or how often can you use one straw ?If a new one is used each time it could work out expensive using their spare straws. I found 6mm dia plastic straws at a better price online which work well. These are just two minor grumbles though. I wanted to ensure that I bought a device that gave accuracy and confidence. This breathalyzer gives both, it is easy to use and gives the results the morning after that I would expect. Given the commercial awards and my experience of this device I would highly recommend it especially for the morning after as it may save an accident or your licence. Seems accurate. Useful for testing before driving to work early morning. A couple of my friends bought these devices months ago and raved about the performance of them so I made a conscious decision to buy one. Let me make it clear that I am not someone who gets razzled every night but rather enjoys a glass or two of whisky of an evening before retiring. Quite often I have had to rise early and drive somewhere but have always felt reluctant to in case I have the old, "morning after result".I ordered my device which came well within the projected time which was surprising because given my remote location. Now it has to be said that the calibration is a tad fiddly but if followed carefully, it is achievable. Results? Well I couldn't wait to test it..well I did have a nice bottle of Whyte and Mackays to hand! I sank a few..enough to make me more than merry. The following day at 09.30 I checked my levels and got told by the device that I was well over....by many points. A pal who is a local polisman came round and did his test and amazingly, the AlcoSense was onthe nail if even slightly more cautious. Around 13.00 he came back and we compared our findings and yet again, the device was spot on.In my humble submission, AlcoSense does the job. For those who want to use it as some mind of guide to see if it's ok to drive home from the pub..get a life, if you are in a pub DON'T DRIVE, all the breathalyzers in the world cannot save you from your stupidity!!! This device is for the morning after, if you have been out visiting friends of an evening and enjoying the conviviality of a few warming glasses and you need to go to work the next day...this is for you.I have given 5* for the device, there's no doubt that it does what is says and does it well but...the one thing that tempted me to take a star off (but didn't) is that replacement 'straws' are prohibitively expensive, there is no way I'm going to pay that kind of money for simple drinking straws. Doubtless the company sells the device as a lost leader and recoups the price of it by selling the straws at a premium price..rather like an inkjet printer. However, I was able to find on Amazon perfectly functional straws for a fraction of the the price of AlcoSense's ones. If you buy straws at between 6mm and 5.5 mm they will work well..and you can cut them in half this doubling the value.If you don't buy one of these and driving is a necessity, you are insane and will deserve being fined and banned. Easy to use with clear display screen results. Handy size and fits easily into the Glove Compartment.Really happy with the Product. Easy to use and set up. If I can manage anyone can! Ensure your under the limit. I recently purchased this item and it does what it says on the tin. I'm very impressed with the accuracy and how easy it is to use. Whilst not cheap, it is good value for money. Excellent product and essential for those who drive for work. I was given one of these for my birthday as it is something I have wanted for a while. I drive a lot through work, usually early in the morning and with the occasional night out, I wanted to be confident that I was not over the limit before getting behind the wheel. I have found this breathalyser to be accurate to what I would expect and easy to use. Both myself and a friend used it in quick succession over Christmas and it prevented either of us getting behind the wheel for another number of hours. My licence is my job and this is an essential piece of my work kit now. It is great and so glad I bought for peace of mind. Easy to use, after reading the instructions,used a couple of times now very happy with the product. This is a simple to use and most reassuring device. I am not a serious drinker but this is ideal for 'morning after' use. I bought mine and now 2 of my brothers in law are doing so. I would recommend it to anyone. Losing one's licence costs a fortune and this is one method of avoiding such a catastrophe. I bought the AlcoSense Breathalyser after researching online as I wanted to have something before the Christmas festivities as I was worried about morning after alcohol levels.The product arrived promptly and wasn't difficult to setup and calibrate, instruction are clear and easy to follow. The unit itself is small and compact and seems robust. It come with a few blow tubes and I ordered another pack of 20.I have used it on several occasions and it seems to provide, what I felt were the "correct" reading based on my previous evenings alcohol intake . I can't confirm it is accurate because that would need for me to be breathalyzed by the police and luckily that has never happened so far. Nevertheless I think it provides a reassuring indication for responsible driver to then make a decision on rather than on pure guesswork that I had relied upon before.. I bought an AlcoSense lite but wanted something that I could program for different regions so upgraded to this version. So far i think its doing what its says. I have delayed a couple of journeys on the basis that I was very close to the limit as this unit gave an absolute reading. Experimented with drinks and delays to get a feel for how my body reacts to alcohol and as others have said you do need to wait at least 30mins after a last drink as readings almost straight after a drink are very variable. The number of positive reviews indicates this is a reliable unit but the instructions for recalibrating etc are a bit complicated so put the instructions in a safe place. Great purchase, was recommended by friends who had the same model. Easy to use and compact, so it can be taken away on trips. Contact with Alcosense who I found to be very helpful and friendly, resolving a minor issue quickly.Would recommend this model and manufacturer. Bought this as I was driving back after Christmas and wanted to make sure I was under the legal limit. This was easy to use and clearly identified I was under the limit.This gave me peace of mind and reassure I was legal to drive.Worth every penny. Very pleased with this product: easy to set up and working well. A winning Christmas present! This has given me the expected results and is good for the "morning after"
This has given me the expected results and is good for the "morning after". If you get a high reading it will tell you when you become safe, which is invaluable. Excellent product. Easy to use and clear output. Problem with readings, no drinks for 18 hrs and still reading above limit. When I first received the item and tested it, the same result after no drinking in 24hrs reading 1.5??? is there a fault with this unit? my previous unit reads '0' I only changed because olkd unit takes so long to be ready! I have found this reassuring for the morning after. though it can be somewhat surprising. This product seems much more accurtae than other cheaper brands. This is the second one I have bought over the years and the customer service after care was very efficient. Simple to use, appeared to be accurate, I had many different people try it over the festive period and they were impressed. Certainly gave me some confidence before considering getting behind the wheel the next morning. On the assumption that the results are accurate, very pleased with this product. Particularly for 'morning after' use. Easy to use and very useful for the morning after. Excellent purchase that takes all the doubt out of the day after the night before. Really good investment and highly recommended. excellent piece of kit. I don't often feel I need to use it but when I do the peace of mind is priceless. I have been using this for a week or two now. It has warned me once, however this was at 0630 in the morning after a Christmas party, I wasn't driving until 1700hrs, I just wanted to see what happened when you were definitely over the limit. Thats the only time its gone red, after a night out with the family and shots when we got home it showed 0.42 at 10am the following day, I certainly would not have driven, I felt pretty hungover, however this little box said I was ok. And I am waiting 20 minutes after food or drink. So do I trust it with my driving license......Not a chance.The delivery was prompt and I have had no communication from the company involved, I will probably buy another brand to compare the two. Travelling in the UK and Europe it is important to me to ensure that I'm safe to drive if I've drunk any alcohol during the day. I wanted an accurate device which would allow me to set any and all options according to different country limits.The Alcosense Elite is substantially constructed and, as far as I can tell, accurate in use. Although I did not find the setting controls to be entirely intuitive, the Instruction Manual which accompanies the device is both clear and precise. In general, the liver can process one ounce of alcohol (or one standard drink) in one hour. If you consume more than this, your system becomes saturated, and the additional alcohol will accumulate in the blood and body tissues until it can be metabolised. Ideally, we shouldn't drink alcohol if we're going to drive or operate machinery. Using the Alcosense I can be sure that I do neither of these things if it's not safe for me to do so.This is not a cheap Chinese import and has a full UK backup service (including 0800 telephone access for support). You get what you pay for and this appears to be a solid product. Not sure how accurate it is, so I would not be 100% sure that the reading is correct, but it does give you a indication. This product has been a saviour, so easy to use and can take it with you anywhere. This is the second time that I have bought these, they are easy to use and carry around. They arrived within the specified time limit. Very effective & useful tool. Very handy tool to have around to keep you safe & convince you to wait longer before driving. "this appliance is very simple to use and is a great reminder as to when you should not drive; especially in the the mornings when one could be over the limit and not realise. this little appliance is well worth buying as it can save you a lot of trouble and money. steve"
After several years of use my Elite started to malfunction. For cost of a service I received a brand new unit. Good value for money Easy to use Reliable Easy to set limits for different countries I tried other machine but they keep giving different answers and had to return them. A small price to keep your license. This device not only gives peace of mind, it ensures that you don't break the law and paying the numerous consequences of doing so. Invaluable to all drivers who partake in a small libation. "Excellent product. Easy to use and is reliable and hopefully accurate! Perfect for checking ""the morning after""." The Alco Sense Breathalyser is so useful, it has made us realise how many units of alcohol we are drinking and how little we can drink and legally drive. It's a salutary lesson and we shall take it with us if we are out to a meal so we know when we must stop drinking. It really is easy to work and is nice and small to carry, you should buy one. Alcosense makes perfect sense - buy one now ! At the best of times we have all thought we were safe to drive having consumed alcohol sometime earlier, it may be hours later, it may be the following morning, we may well factor in how much we have had to eat and how much water we have consumed since. How very mistaken we can be and very often are, the alcosence elite breathalyser which I purchased is amazing, what cannot speak cannot lie, suprise yourself, try guessing and then blow, save yourself the trouble, one of the best investments you can make. Clunk click, and blow into this! I bought the product in August 2012 and it worked well without problems until June 2013. When it was switched off it started to emit a sort of scratching noise and although it still worked it was consuming a set of batteries on a monthly basis. I returned it twice (at my expense) and eventually the unit was replaced. The new unit is working and there has not been any obvious battery drain in the last week. I hope the new unit continues to work for a long time. Accurate and compact easy to carry and very easy to use! Delivered next day, when they said two days. Very easy to use if you follow the instructions. The customer service is first rate, and very friendly. I am a driving instructor, and I've already had two people who where over the limit, which saved me from prosecution as well for aiding and abetting a drunk driver!! Its un-obtrusive to use as you just blow over it, not into a tube. Highly recommended. Works well, great for testing the morning after a night out. You blow and its go or no go! fantastic product better to be safe than sorry, specially the morning after . Have tried the product out and is very good and accurate, very good investment at a very comfortable price ,gives one peace of mind and safe positive driving. Would recommend to any discerning driver. Good could be great except for the blow ---? One Breathalyser sent back. Did not hear what was wrong with it as I would have been interested if it was me. The only problem I know have is getting the blow right - It is difficult but not impossible. Ordered a set of one-shot breathalysers and Alocosense's basic electronic product. The electronic breathalyser is good and seems to work reliably. Haven't yet had the 'chance' to use any of the one-shot breathalysers specified for use in France. However, was not initially very impressed with delivery. Having paid for next-day delivery, was then (i.e. after they had the money) sent an email apologising for the fact the electronic tester was out of stock . On complaining that the order may as well be cancelled as we were leaving for France shortly and needed the one-shot breathalysers asap, they did arrange for the one-shot testers to be sent by post and they did arrive in time, so that was OK and we appreciated the effort to get us the vital bits on time. The electronic tester duly arrived a couple of weeks later. As delivery was thus in two lots, I appreciate that Alcosense had paid more than they bargained for on delivery costs. However, I had not get the next day delivery I had paid for and they did not offer a refund of the premium delivery fee, so it seemed a bit chaotic from a 'world class' customer service point of view. Subsequently, pleased to report that once they had taken on board the problem AlcoSense responded very positively to make amends, with postage refund and a batch of spare tubes. As this was only a small order to start with I was impressed with the trouble they took to make good. Now more than pleased to join their large group of unqualified fans. Useful tool - gives peace of mind. First class customer service when LCD screen failed. Does what it says on the tin, I hope. Simple to use and self cleaning too. I've used it on 3 occasions so far. I used it after fairly light drinking then waiting around an hour after my last drink to get a reasonably stable reading - on all three occasions I was well below the limit. Just a couple of issues with the instructions. I have washed the straws in order to reuse them. It is not clear from the instructions if this could cause any problems. Also the unit does not appear to shut itself down after performing a self clean. As you are not sure when the self clean has finished, this can cause you to leave the unit on by mistake. Overall, I am pleased with the unit and find it really useful. They are an excellent check to make sure that you are not over the limit. I give them to my sons who are at university to make sure that they don't drive over the limit. Nice to know where you are in the morning. Sometimes you may wake-up the morning after a party and feel like you still drunk. This only becomes a problem if you have to go to work or need to attend an unavoidable occasion. With this product you can quickly check whether it's safe to drive or wait a while. I know this isn't much good if you are going to be late for work but at least you are aware of the situation and can on the odd occasion make an excuse. Better to be late for work and make your time up, rather than lose your license. It's also a fun and informative product to take to the pub with you. You'd be surprised how many mates think they are still OK to drive, only to find out they would be over the limit. So to that ends, it's educational too. I have the Alcosense Elite and am very pleased with what I've seen so far. Small, light and easy to operate. Bit of messing around setting up the sensors at the start but all very simple to use after that. I sometimes come home after working late and have a drink or two while processing some paperwork. Later the same morning I have often jumped in the car to pop to the shops not having a clue how much alcohol is still in my system. The Elite has picked up where I have been drinking and I'm pleased to say that I have yet to trigger a warning not to drive. But to test it before this I have drunk a fair bit then waited the obligatory 30 mins and it showed red and that I'm over the limit, so it seems to work as advertised. I'd recommend one for peace of mind after the night before. A co-operative and Customer Focused Company providing excellent service. Compact, easy to use and appears to be accurate in recent test circumstances. Great item, takes the worry away from driving or not. Just stick to the rules mentioned in the booklet. The staff were really helpful with my enquiries, and I received my order quickly. Will definitely use again. This elite breathalyser is a must have. It ensures that you are safe to drive. Very impressed with the AlcoSense Elite. Gave really good readings against my work kit (I'm a traffic officer by day). Great for the morning after a night with the boys! Great to check the morning after. Takes about a minute to get a reading. Well-made, clear instructions and easy to use. For 60 quid it's not worth NOT having. Keep in the car for mornings after. Good product delivered on time . Never be caught out again! Purchased it as a Christmas present for my other half shortly after he was pulled by the police on his way into work one December morning. Fortunately for him he was under the limit however it shocked him all the same that he still had alcohol in his system. Neither of us would attempt to drive now without using it & I can honestly say it was money very well spent. I would suggest keeping one of these AlcoSense Breathalysers in the Glovebox. Is only seems to be truly useful the following morning after you've been drinking the night before! Bought and AlcoSense Elite. The product is great, really pleased with it! Spoke with them on the phone before ordering and the guy I spoke to was helpful and seemed to know his stuff. Came quickly, easy to use and I would highly recommend the company and the product. I purchase the Alcosense after breaking a more expensive model made by a competitor i was very skeptical as to wether it would be any good as it was a fraction of the price compared to my previous one. The product is spot on and i would recomend it only one let down it was a bit tricky to set up you have to calibrate it my previous one just needed batteries and switch on. I bought an Alco Sense Elite which arrived quickly. It developed a fault and was returned. It was replaced under warranty no quibbles. I cannot fault the service provided. Product as described and delivered quickly. Very good service. Bought this just after new drink drive limits came into effect. Bit fiddly to set up, however thereafter great and very easy to use. Well worth it. Now Group a superb company. The service that I received both with a problem that I had concerning a AlcoSense Elite that I owned and the reordering of a replacement was second to non, absolutely superb. Good product, good service, good prices and friendly staff. A bit fiddly to use - and to calibrate, which leaves you wondering if you can rely on it. Complicated instructions. A bit tricky to set up but easy to use. My son was thrilled with this Christmas present. It does the job and it's used frequently! What a relief to be able to check you're safe to drive morning after. Brilliant product. "excellent product however I had already used one which worked perfectly for five years. It stopped working when I dropped it and split the casing; which is why I have a new one"
This has saved me a couple of times. For example after the work Christmas party, I was all set to head off, I checked myself. I was well over the limit. So I sat back in the hotel lobby for a couple of hours, had a coffee and lunch and tried again. Definitely worth it. Makes you feel confident when you get in the car. My Alcosense Elite has performed well for the task that I bought it to do. An annual re-calibration was provided without any fuss. use common sence when testing with this device. do not drive if you feel in doubt. Product relatively straight forward to use after first digesting the user instructions. I expected to see consistant results I.e the same reading after performing 2/3 sample tests in a short space of time but this was not always the case although I have to say the results were repeatedly quite close. At the end of the day the device is a useful tool but results should be used as a guide only coupled with common sense. Alco Sense has its problems. Calibration is a concern in terms of the machine's accuracy and it is not set up for new Scottish law. Also most of the family struggle to breathe into machine at appropriate pressure. Blow into here please sir! How much is YOUR driving license worth??? I never drive when Ive been drinking (or do I ??) what about the morning after? I bet there has been more than one occasion in my life when Ive been close to the limit the next morning. So I bought one of these - especially now that the limit has lowered in Scotland (I work in scotland maybe once a month and stay in a hotel and have a couple of drinks) I did some tests when I didnt have to drive the next day. On one occasion (my big test) I drank a LOT and I was on 79 at 10:30 the next day. 80 is a fail / ban. 90 minutes later I was ok (I didnt drive all day) its a sobering thought.... especially if you go to work at 07:00 etc. Imagine being involved in an accident and hurting somebody including yourself and passengers - then finding out you were over the drink drive limit. I couldnt live with that thought.Whilst this unit has been set to turn red near 80, it still tells you your Blood Alcohol as a number, so you dont need to buy a special one if you live in scotland - but at the time I purchased it, I think they were gearing up to providing 2 options. You can send it of once a year to get it re calibrated if you are seriously concerned But I think that I'll have a better understanding of my limit much sooner. Not very sure it works that well and can be a bit inconsistent. Do not drink or eat anything for at least an hour before you use it even food, tea or coffee as throws results. Reality check for those than enjoy a tipple. Seems ok, Interesting to monitor alcohol levels at the night an morning after. Makes you think, and has surprised a few friends who thought they would be fine.Happy to say, I've never had a morning after reading ... I did buy extra straws, but just rinse and dry the original, it works fine. A perfect way of checking whether you or your family member are ok to drive especially if its the next morning. It is always right to play safe before driving and this elite alcosense device is reliable, easy to use and great to trust. Brilliant buy. Product functions satisfactorily but I should have been offered a unit calibrated to 0.5%BAC since this will be the new limit in Scotland from next month. I purchased this product about three months ago. It was very easy to set up following the simple instructions. I have used it as I intended to which is to ensure that I am not over the legal limit before driving. In fact the re assurance given by the result (I'm pleased to say always thus far "lo") removes that uncertainty that can exist the morning after maybe just one too many glasses of wine. It is exceptionally easy to us and I am delighted with the product. A Brillian Breathalyzer which really does the job. I cannot speak highly enough of this excellent product. My family and I are not heavy drinkers, but all the same the AlcoSense Elite Breathalyzer has given us complete peace of mind. The Breathalyzer has been thoroughly tested out and we have full confidence in it. I would recommend it to anyone who is not quite sure whether they have exceeded the limit or not and, with Christmas coming up, it would make an excellent present. Arrived quickly and well packaged.Relatively easy to set up and get started.Clear instructions and clear warnings contained about the morning after.I have tested it a couple of times and it works well giving a clear result on the display screen.Obviously I cannot say how accurate it is but obviously even if you have a borderline reading,I wouldn't attempt to drive. Really impressed with the quality and apparent accuracy of the Elite. Found it easy to set up and use (remembering to leave 30 mins after eating / drinking anything). Would recommend it, particularly as we approach the festive season. Even if you are in Scotland where the limit will reduce to 50 mg, the fact you get a digital reading means there is no real need to get it reset from the red warning at 80 mg for the rest of the UK. Delivered promptly. Easy to initialise the sensor. Extremely easy to use. Gives an accurate numeric measurement. Also pretty interesting to see how much mg /l of alcohol after consuming a few beers.I'd recommend this product particularly for the numeric mg /l figure, to quantify how much over the limit you are. I must admit I haven't used this yet but you will need to read the instructions as you need white wine to set up! I previously had the Alcosense Lite version, and this in comparison is a little more complicated. It has to be self-calibrated which is a drawback in the first instance but has the advantage that it can be re-calibrated. My pet dislike is that the lowest it reads is "Lo" which I gather means lower than 0.2%bac. Not too much of a drawback when in UK (lower than 0.8) or western Europe (less than 0.5 but. I often drive in Eastern Europe where 0.22 or even 0.0 is the limit! So "Lo" could be pretty tight. The Lite version counts down to Zero, much more useful! The Elite however, does seem remarkably accurate, and it's easy to clean the sensor to maintain this accuracy.All in all I think this is good value for money, but I think I may have my old "Lite" serviced for the below 0.2 predicament. I may be old fashioned but I don't like to drive with ANY alcohol in my blood, my license is too important to me! Being a professional driver, I am acutely aware of the effects caused by alcohol on the driver. There are times however, when initially there is no intended or planned driving and alcohol is consumed, but then the situation changes. There may be an unexpected requirement to drive and this creates the problem regarding motoring safety. Although one may not have consumed vast quantities of alcohol, several factors can affect the rate at which it is removed from the body. Where there is ANY doubt, one should NOT drive. However, to this end I purchased an Alcosense Elite unit and after CALIBRATING it in accordance with the manufacturers instructions, I began to use it to see how beneficial it might be.The unit is very simple to use and can be set for the criteria in different countries. There is a pre-use count down period during which you can prepare to give your breath sample via the plastic straw. A long steady blow at normal breathing effort is all that it takes. It is recommended that you rinses your mouth with fresh water, prior to giving the sample, to remove any residue alcohol in the mouth.While the unit does NOT inform you that you CAN drive, it gives clear feedback if there is little or no alcohol detected. If the unit detects higher levels it displays a NO DRIVE warning and the screen changes to RED.I have used the unit after drinking wine (11% to 12.5%) and also after drinking spirits (40% to 43%) either following an evening out or after a restaurant meal. The unit has responded differently dependant on the time passed since the last drink and also the strength of the drink in %age. The higher the %age the longer it takes to clear from the body and the longer the user should NOT drive.The unit is small, easy to use, and as long as it has been calibrated and allowed to "self-clean" after each use, it could be a useful aid by advising you not to drive with an elevated blood / alcohol level when you are under the impression that you have none at all.The best advice given is not to drive with any alcohol in your system; if used correctly Alcosense Elite can detect alcohol in your system and alert you with a DO NOT DRIVE warning.It cannot stop you from driving; THAT is your decision and the Alcosense Elite has been developed to help you make that decision NOT to drive.Using the Alcosense Elite could prevent an accident and could also protect your driving licence. Small, easy to use and gives consistent readings. Too difficult to use. Spent hours trying to configure, following the instructions again and again. Kept getting error message. Eventually gave up and sent back for a full refund. Makes the morning after less stressful. Works a treat and make the morning after the night before less stressful. Once calibrated, the unit is very easy to use - open it up, wait 20 seconds for the sensor to reach working temp and blow into the unit. For my first test, after just over half a bottle of wine it registered 1.5x driving limit, which seemed reasonable. Very happy I will now know when it's safe to drive. Excellent product. Read the instructions so you understand how it works. It's a scientific instrument and needs to looked after / calibrated etc..
Good product but do follow the instructions!! Wonderful, re packaging, delivery time and quality of goods as described.Thank you. Very good product. Bit of a fiddle calibrating, but otherwise hard to fault. Should have bought this ages ago! Very impressed with this, I'm always wary of driving in the morning after a good nights session, with this, it does give you a little peace of mind. I have tried this on many occasions now and if you follow the correct procedures when you set it up (which isn't hard) I find that the readings it gives are very good, lets face it folks we all know when we shouldn't drive but it is for that time when you think am I ok to drive or not? The set-up is a little involved, more so than the advertising would suggest but I persevered and it seems to work as far as I can tell. The couple of readings I had so far were as I would have expected. I believe that typically one unit of alcohol takes an hour to clear our body. That is a generalisation and it does vary considerably from person to person.I'm writing this as the supplier believes they are getting malicious negative comments from "non-verified" customers.Some negative comments do seem to go a long way back though? Hard to know if it is completely acurate but have experimented without needing to drive and it performs consistantly. As everybody reacts differently to alcohol I am now confidant to use it and drive on the results it gives. Having the What Car approval too gives it 5 stars for me. great product seems very accurate,however dont use it after eating or brushing your teeth because it gives an abnormally high reading.other than that well worth the money and peace of mind. Purchased this item because I absolutely hate the feeling the next day after drinking, worrying if I'd be ok to drive or not. This great little device works perfectly and takes a load off my mind. Just be sure to read the instructions to it carefully before use. It is an easy to use breathalyzer. It gives a good level of accuracy as far as I can tell. We are very happy with it. This is a top-notch and very accurate piece of kit that, once set-up, gives reassurance that you are safe to drive the morning after a heavy session. Stopped me driving on New Year's Day until it was safe for me to get behind the wheel. It would be disastrous to lose one's licence 12 hours after you have stopped drinking! I have used it to great effect in the morning after. It is easy to set up and use. I have confidence in this product that it will tell me when I should not be driving. Definitely recommend. I bought this a while ago in preparation for the festive period - I live in the family home which now consists of four adults of drinking age and able to drive. I felt it the responsible thing to have family breathalyser so anyone off to enjoy the festivities could do so safely.So far, I have been very pleased with this device. I've used it a couple of times the morning after a night out and it has read what I expected. Similarly, other members of the family have used it and found the same.It's small and you can just pop it in an over night bag or wherever.Definitely read the instructions and make sure you set it up correctly.I am very pleased with this purchase. I bought this as a Christmas present for my 20 year old daughter. Not that she would ever drink and drive, more for the fact to check that she is safe to drive the following morning, which is something that a lot of people who have been out the night before tend to forget about.Although it took a few attempts to work out how to initially use it, she uses it regularly now if she's been for a night out the night before and has to drive anywhere the following morning.I would recommend it to everyone. A great idea. link below to 5th gear (channel 5 version of top gear) review of market breathalisers including this model and hence why I got it. [...]Had a few of the dispolsable French breathalisers left over from a trip to France in my car. After a particularly heavy night out of curiosity decided to test myself on one and was suprised to find myself still over the limit the next morning at 9 am, scary stuff. I assume I must have driven over the limit in the past without knowing it, so the responcible thing for me was to get a propper breathaliser. The consquences of driving over the limit are scary - potentially jail and criminal record!Did a bit of research looking for a suitable product to use to see if I am legal to drive the next day as it would be a nightmare getting caught accidently over the limit. This product seems to be a good product and have on multiple occasions found myself over the limit the next morning so its been a good investment.Product came quickly and well packed, seems to be accruate, Read the information not suitable really for 1hr after a drink as levels vary so more a morning after product. was a bit sceptical at first, was going to get the intermediate version but they upgraded me to the "Elite"version. My Brother in Law is a Traffic Cop he tested it talked to his mates at work about it & it turns out its pretty dam accurate!Cant rate this company highly enough. Yes,it takes ten minutes to set up and understand,but after that,it is instantly available for use.Provided you haven't drunk alcohol in the past 30 minutes.Even the police ask that question before breathalising,-it buggers up the sensor,and gives false readings.We are measuring alcohol on the breath here,-not in the mouth and throat.It has prevented me from driving when I thought I may be OK,-and told me that I was good to go,when I was dubious.I drink every evening,and it's next day results usually confirm my own prediction,it is the ones that contradict me that are important,and the reason that I bought it.It will be sent back to the manufacturer,on at least a yearly basis,for a full work-over,for which there is a modest cost,but I consider it well worth while.If you are looking at this,you probably would benefit from this product. Very good, but care IS needed! Part 1: The first AlcoSense Elite I received was difficult from day 1 and soon stopped working altogether. After a brief phone call, It was replaced promptly. Top marks there, then.Part 2: The replacement has been working well until this week. Performing the full Sensor initialization/reset, with Auto Sensor Cleans, as per the Book (pages 8 & 9), has restored its normal behavior. Another tip; if you use the same Blow Tube repeatedly (for yourself, of course), rinse it through under the tap occasionally.A good value device that can be recommended to caring users. As responsible drivers, we bought this home breathalyzer to ensure we are OK to drive the morning after we have had a drink. We always thought we were OK but this neat little gadget has put our minds at rest. It is stylish and easy to use. It takes seconds to check you are OK to drive and saves you losing your licence.Every driver should have one. A little practice when sober is useful to get the hang of the breathing out rate required, but every gadget has a learning curve, and this one is a short curve. Initial calibration is clearly explained and the machine is easy to use. Highly recommended. use it all the time i have been out for a drink and it is very useful and would recommend it to any body. This is an excellant product, I have found very useful especially after a party or celebration the. Night before. I would not drive without first knowing that I am able to do so legally. This product gives me that assurance. I used this product at 0830 in the morning, after drinking heavily the night before until the early hours of the morning. I was registered as LOW 3 times, with 3 different tubes. Needless to say I didn't trust the reading in the slightest and took a taxi home, to which I used the cheaper version of the product which read me as HI, again tested the result 3 times with 3 different tubes. I've used this a few times now and seems to be spot on, tried after a few drinks high reading, and a couple of times in the Morning after a night out, both times later in Morning it went Sky High, So worth the money. It may save my licence. I do not drink and drive or so I thought? Often we go out for lunch and I have a drink before my meal and a glass of wine with my meal. I eat a three course meal and I would think there is a hour from when I have stopped drinking to driving my car. I have now found by using my Alcosense that because I live in France although okay to drive in the UK I am with their rules over the limit to drive. You can be stopped randomly. Scary really! To be done for drinking and driving must be devastating. If you had an accident and someone was killed or injured you would never forgive yourself. Even if just prosecuted to not be able to drive and then later not to be able to get insurance without costing a fortune. Plus the shame.A wake up call and no longer can I be in denial. On the plus side you can check yourself and be reassured and it is a fun gadget to use. It amuses my husband when he has drunk more than me that his level is much less than mine. I think it puts you in touch with your body and how your body processes alcohol. It appears to be accurate and can't comment on how well it does long term as have only had it a couple of weeks. It is now always in the car and just reminds me to never drive when over the limit of your country. A good idea for everyone. I have bought them as presents. like most people, I would never go on a bender then drive home,I always get a taxi, but the worry always remains:what about the morning after?Plod has all the kit to test this, but I do not. I bought two units and compared results from both, as Â£130 is a bit cheaper than no licence!Read all instructions, take time to set up, then experiment to check varying results-spirits are the kiss of death for the early morning drive, as is no breakfast and a cup of tea. A lot of wines are 14-15% now whereas they used to be 8-9%.99% of the time if you go out for a meal and a bottle of wine there is little or no trace. Removes the worry-but I have changed my drinking habits as a result of this purchase. Fabulous service from Gadgets4Travel. The breathalyser ordered was the lite but this was out of stock so the company upgraded me, free of charge to the Elite, the next model up. I was delighted with the free upgrade and speedy delivery and the product appears to be very effective. It certainly is a good aid the following morning after drinking! Don't second guess yourself again. Courtesy of Gadgets4Travel, I was sent this free of charge as opposed to my original order of the Alcosense lite . I was astounded with the potential of what this can do, the calibration side may be fidly, but it is necessary and the added five straws in the box was a great benefit to start with. Last year I would say I came close once to being over the limit (which I AM NOT PROUD OF), fortunately this now takes the guess work out and the morning afters won't be as risky. Ideal investment for 2014 as the police and even some work places clamp down on being under the influence... Dont second guess, potentially putting yourself and others at risk, get it. Fantastic ssrvice and delivery. Very pleased to be upgraded due to stock issues. Brilliant and accurate device. Come in handy over festive period and so glad. It showed my husbands alcohol levels were very high at 13:30 in afternoon which was an eye opener and just goes to show you that you think your within safe limits but your actually not. Well worth ever penny and highly recommended to anyone. Does what it say,s on the box. A little difficult to set up but the instruction leaflet takes you through it step by step. I bought it for my daughter so she will know the morning after if it's safe to drive. Gadgets4 sent the Elite model for the same price as the Lite model which I had ordered as they had sold out the Lite model so hats off to them as it would not have been here for Christmas. I would recommend it for all drivers young and old. I bought the AlcoSense unit as I was going on a company evening function for Christmas with some colleagues from our Sales Team.I wanted to be sure that myself and all our sales reps. had the ability to make a decision as to drive (or not) the following morning so I surprised them with the Alcosense at breakfast "the morning after"!No one was offended by my proposal that they each blow into the unit in fact it became a bit of a competition and the great news was that all the guys passed the test bar one who was borderline so he stayed back in the hotel for a couple of hours then tested again and got the all clear to drive.Everyone thought it was a great idea to have done the "group test" and we will definitely do the same again in the future.In fact a couple of the guys said they would buy a unit for themselves to keep in the car.A really great bit of kit! I was given an Elite Breathalyser as a present earlier this year. As I work for the Police, it is imperative that I am always safe to drive as some of my shifts start very early in the morning. Over the last 6 months I have tested the unit on a number of occasions after knowing how much I have drunk the previous evening - I have found that the breathalyser provides consistent and accurate results which I trust. The unit is simple and quick to use (takes less than a minute) and gives me peace of mind knowing that I am safe to drive the following morning. I had read the reviews and it seemed like a very worthwhile investment especially with the festive period when there is always a nagging doubt the following morning, and this gives you a good degree of confidence. Exellent, would recommend to anyone. May same pricey but how much do you value your licence and more importantly, you safety and that of others? Just What The Police Ordered!! I wanted a simple to use breathalyzer, something I could use at a party or when out for a meal and wasn't to obvious, well the Elite fits the bill 100%. Having read the instructions carefully I found it easy to use and accurate - certainly very consistent. One or two of my friends have rather cheap quick test 'breathalyzers' - one is just a key ring really and their readings are all over the place, two consecutive readings are never the same. The Elite on the other hand gives consistent readings time after time. I would highly recommend this model and agree completely with What Car's verdict. We like a drink, but are always conscious that we may still be over the limit to drive the following morning.The Alcosense Breathalyzer has taken the worry away - it is so easy to use (after you've done the initial calibration) and on many a Sunday morning, it has been invaluable in stopping me from driving too soon!The only warning I would give, is dont use it just after having a cigarette, as you will get a totally wrong high reading. Only had one for a few days, but extremely happy with it. Readings pretty much what I would have expected ...Morning after a couple of drinks the previous night, reading said "LO". That was fair enough, but I did wonder how accurate this was, so I did a more substantial test - 30 minutes after coming home from a lunchtime session watching rugby in the pub, I got a reading of 1 point something, which was hardly surprising. An hour or so later, when the alcohol was presumably still being processed by my body, the reading was "HI". 12 hours later the reading was "LO" again - a little surprised at this, but maybe my body is efficient? I wouldn't have driven anyway.The advice given in the instructions (read these carefully!) is not to drive unless the reading is "LO", which is sound advice.In reality, I'll only ever use this as a guide "the morning after" because I never drive immediately after a drink, even if it's only one pint. Bought this as I thought it would be great to have as you hear about so many morning after drink drivers.It does require a bit of setting up that I wasn't expecting and the brief instructions seem a little daunting the first time you read them but read a few more times and it all makes sense. You really just need a bottle of white wine and a little common sense. The setup went very smoothly, drank the rest of the wine (naughty) and waited half an hour (you have to have nil by mouth for half hour before to help keep the sensor clean and prolong it's life). Blew just under the limit, receiving a yellow/red flashing screen advising me not to drive due the the high risk. Very impressed. Have conducted experiments with drinking different amounts and the results seem consistent and the unit is very easy to use. I do seem to clean alcohol faster from my system than alot of my friends, but still have to intention of driving unless I feel fully sharp.The instructions with the unit are due for high praise as they contain alot of facts that I didn't know, detailing the time it takes for alcohol to filter into your system and the cumulative effect this has. And to use it and see these effects in action is a real eye opener. After one night out my BAC kept rising for just over an hour after doing my first breath test peaking over and hour and a half after I stopped drinking. It really is a very educational and worthwhile product to have. It's also reassuring to know that if I do have two or three pints the night before that I'm ok though some people may not be. It's remarkable how differently people process alcohol than others though and I would thoroughly recommend this product as it's best just to be safe.Looking after it is fairly simple too. It will do a "quick clean" after every blow, and you can manually run an extended cleaning cycle which they recommend doing every couple of weeks. You also have the option of sending off for an annual service/deep clean which isn't too expensive and detailed in the documentation. I had heard stories that people who drink the night before could still be over the limit when they drive to work the next morning. Not wanting my family to be caught out in such a scenario, I thought this would be the ideal check. It gives peace of mind. very pleased, worth paying extra Â£ for quality product. very pleased, worth paying extra £ for quality product. Easy to use and fantastic value for money. Clearly indicates if you are not fit to drive. I love it. This item arrived the day after it was ordered, though we had not asked for special delivery. It was a bit of a hassle to 'set up' as it had to be given drinks of diluted wine! At first, we were not sure if it was registering correctly but, after several uses and comparisons between different family members, we are happy that it is doing so. My husband wanted it so that, if he has to drive 'the morning after', he will know that he is safe to do so. In that respect, I think we will find it invaluable. Mine doesn't seem to work! This breathalyser seems to give an accurate reading of your intoxicaton level,and gives you re-assurance that you are safe to drive even though you have that morning after groggy feeling. The unit is very compact (like a mobile phone) so is easy to carry round. It isnt too difficult to set up and to use it is quite simple. It is mainly geared for use 'the morning after'. My reservations are that it should be cleaned properly on a regular basis and this is a right rigmarole. It entails having to make a diluted alcohol solution and then putting some of this into the machine to get a test reading. Also it states it should be serviced every year by sending it back (and paying obviously. )None of this was mentioned in the sales pitch. Maybe they are all the same, but I wish I had been given a bit more information when choosing. Delivered in good time, and appears to do what I expected it to do, which is all good. No issues with vendor or product. excellent piece of equipment i use it every morning if i have had a drink the night before it gives me peace of mind and an idea of how much i can drink at night and still be under the limit next morning. Excellent - but follow the instructions carefully! The big question is 'Is it accurate?' I doubt whether any home reviewer is in a position to answer that question with authority. All I can say is that based on reports I have read and on my own experience (the results are what I would have expected them to be) I have quite a high confidence in its accuracy.The point to realise is that there can be massive variations in the readings which have nothing to do with the accuracy of the instrument. The makers explain this clearly so take notice of the instructions!If you have any residual alcohol in the mouth it will affect the reading; you need to allow at least 30 minutes before testing. So as the makers make clear, this is definitely not a 'test yourself before driving home' tool. The readings can also fluctuate according to your breathing pattern. The reading can seem quite low after vigorous exercise, but rise considerably even a few minutes later when breathing normally. To be confident of an accurate reading you need to get into a normal breathing pattern and achieve consistency in at least three consecutive tests.Technically the instrument is fine and easy to use, very much resembling a slightly old fashioned mobile phone. My only problem is an inability to understand the scrolling menu! Thankfully it isn't often needed, but when it is I have to refer to the instructions. save your license - and your relationship! Works well, but FOLLOW INSTRUCTIONS CAREFULLY! The most obvious question is "Is it accurate?" This is difficult to answer, but this is a top end product and from my own experience and other sources of reference I am reasonably confident that it's accurate if used sensibly and in accordance with the instructions.If used too soon after consuming alcohol the results will be affected by residual alcohol in the mouth and throat. The reading can also vary dramatically according to the breathing pattern just before use. It can be hard to get this right. For a reliable reading it is important to relax and breathe normally beforehand. I would recomment taking three readings to verify that a reasonable consistency of readings has been achieved.All in all I think this is a useful device which can make users aware that their blood alcohol levels are higher than they realised, even some time after drinking. It certainly isn't something that can be used to "drink up to the limit".As a gadget, it feels well made, is well designed and easy to use. It looks and feels like a slightly oversize mobile phone. My only criticism is the slightly awkard (for me) method of selecting "modes". This is an excellent and easy to use product. If your ever in the situation where you've consumed alcohol and don't know if your fit to drive the following day then this is the product for you....it could save your license. This alcosense is a handy little breathalyser, its very easy to put in your pocket and is one that would be recommended by police to own. I think this is a useful thing for anyone to have especially for the next day thinking your ok when you might still be over the limit. I bought one for myself and other family members and they are more than happy with it. Better to be safe than sorry!!! !